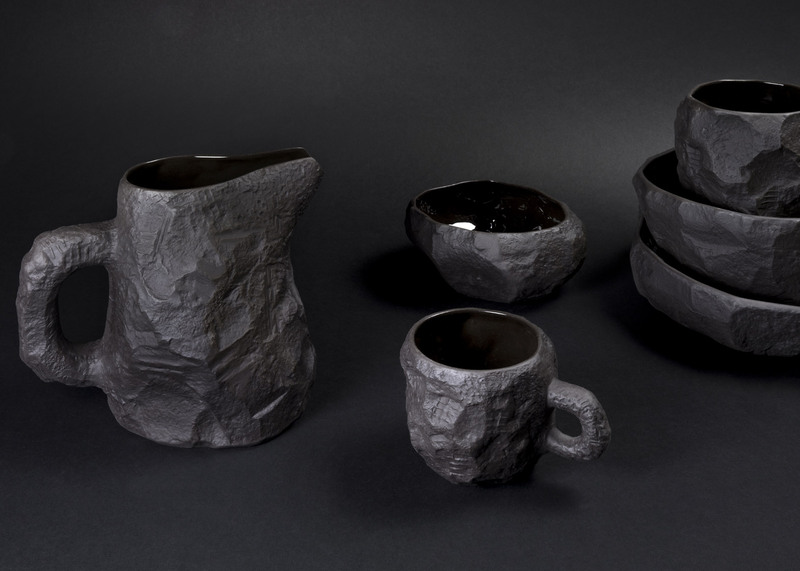 Each of the pieces in this basalt tableware range by British designer Max Lamb has been cast from a hand-carved mould. Lamb's Crockery in Black Basalt collection was designed for Staffordshire ceramics company 1882 Ltd and follows on from his fine bone-china Crockery collection. For both collections, to create each of the masters – the three-dimensional models from which the production moulds are cast – Lamb chipped and carved a solid block of plaster using stonemasonry tools. Each piece in the range is then slip-cast from the plaster moulds in basalt – a dark-coloured and fine grained volcanic rock. "Black Basalt is ceramic," 1882 Ltd designer Emily Johnson told Dezeen. "It is a stained stoneware. We stain the slip and then cast the piece, fire it, glaze it on the inside and fire it again." The interiors are then glazed for practical use, while the exteriors are left raw to reflect the texture of the master model. The Basalt collection includes a mug, jug, vase, salt and pepper shaker and various sizes of bowls. It will be available exclusively at London design store SCP from 2 June. Other designers working with basalt include South Korean artist Byung Hoon Choi, who used the material to create a collection of sculptures that double up as oversized outdoor furniture, and Jeonghwa Seo, who designed a collection of basalt desktop accessories with shapes referencing a volcanic landscape.